Due in this Wednesday at Sports Cards Plus is 2014 Topps Five Star Baseball, 2014 Bowman Draft Picks & Prospects Baseball, 2014 Bowman Sterling Football, 2014 Topps Platinum Football, more 2014 Crown Royale Football and TONS MORE of all your favorite products at LOW, LOW, LOW Prices! If you didn't make it in to Sports Cards Plus, a.k.a. The Super Hit Factory this week, here is what you missed. Hector heard about The Legend of The Super Hit Factory from his home in Mexico City. He read about the Panini 2014 Black Friday Pack Promotion. He had a business trip to Austin, Texas which happened to coincide with the Panini Black Friday Promotion so he arranged for a round trip to San Antonio and drove to Austin. Hector collects basketball, and like all of us would love to pull a Jordan autograph, the only missing piece to his basketball collection. He decided 2013-14 Upper Deck Exquisite with 5 FREE Upper Deck 25th Aniversery Packs was the way to go. Here are Hector's favorite hits from last Monday, a 2013-14 Flawless Allen Iverson Emerald Auto 1/5, a 2012-13 Intrigue Kobe Bryant Auto #d/25 and Hector's first Michael Jordan Autograph. On Hector's return on Wednesday, he decided to try another box of Exquisite and Flawless. 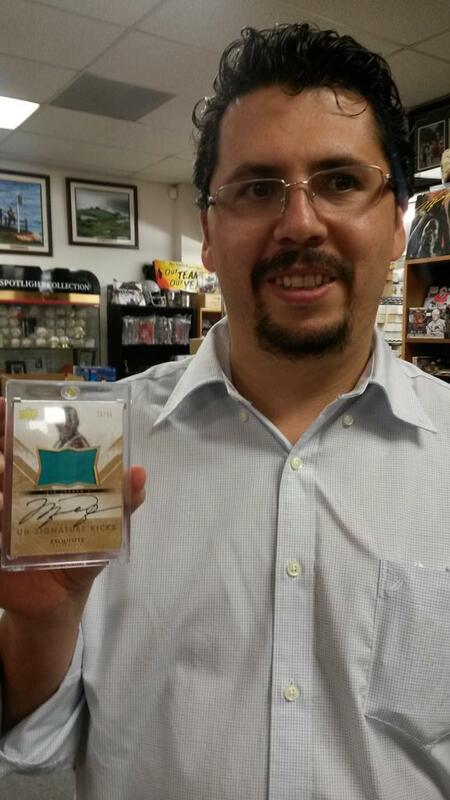 Here is Hector with his second MJ Auto a 2013-14 Exquisite Michael Jordan Signature Kicks Auto Shoe Card #d/35. His box of Flawless got him a Kobe Bryant Auto, an Oscar Robertson Auto, and a David Robinson Autographed Dual Jersey Patch. And, The Legend of The Super Hit Factory continues. The arrival of 2014 Topps Dynasty Baseball drew Marcus' attention. For only $319 per box, Marcus wanted to pick his box from the BEST CASES in The Hobby. Marcus pulled a 1/1 Topps Dynasty Randy Johnson Autographed Diamond Back Snake's Head LOGO, so he decided to try another. Next he pulled an Albert Pujols Auto Jersey Patch #d/10. He had to try another and pulled a Jose Abreu Auto Patch RC. Marcus decided he had to see what was left. Next come the Mike Piazza Auto Mets Jersey Patch and the Yadier Molina Auto Patch 4/10. Will came in for more great Panini products and some FREE Black Friday Packs. Will has never pulled an Andrew Luck autographed RC, so he tried a box of 2012 Panini Black Football. Here is Will with his Andrew Luck 2012 Panini Black Gold Ink Auto Jersey Patch RC and his Jadeveon Clowney Autographed RC from his FREE Panini Black Friday Pack. We had customers drive from as far as 140 miles for some great Panini products with FREE Panini Black Friday Packs. Chris and his wife drove from Corpus Christi, Texas. Here is Chris with his Johnny Maziel 2014 Crown Royale Auto Silhouette Jersey Jumbo Patch #d/25. In just four days we have had FOUR Johnny Manziel Autos pulled from 2014 Crown Royale. And, The Legend continues. Chris knows The BEST CASES in The Hobby are at Sports Cards Plus. Chris came in for the NEW 2014-15 Panini Prizm Basketball JUMBO box ($175) with one FREE Panini Black Friday Pack. 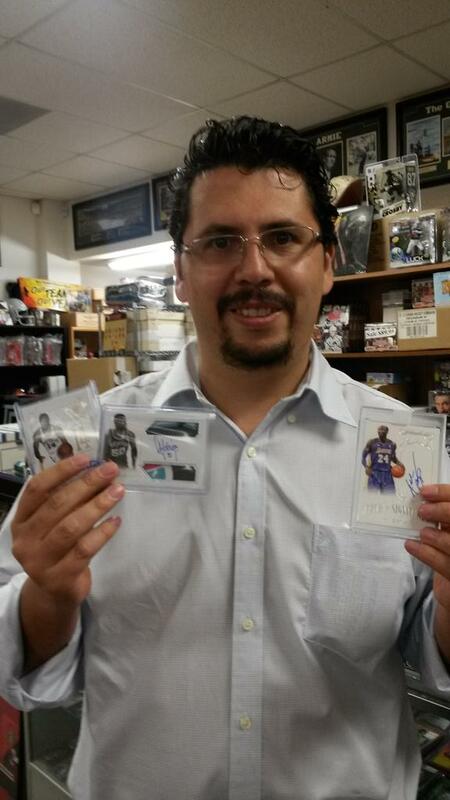 He pulled this Jabarri Parker Auto RC and Andrew Wiggins Auto RC from ONE BOX. And, The Legend continues. Mike came in for some Super Hit Factory MOJO and a FREE Panini Black Friday Pack. Here is Mike with his 2014-15 Hoops Basketball Jabarri Parker Auto RC. So, what are you waiting for? Don't be the guy who says, "That could have been my picture." Come to Sports Cards Plus TODAY and continue The Legend.